At military microgrids in hostile territory, reducing fuel use is more than a green effort; it’s a life-saving endeavor. Afghanistan offered an eye-opener. Vulnerable to attack, one in 24 U.S. fuel supply convoys resulted in a casualty there, according to an Army study. “Lives are lost. The fewer tanker trucks they have to take out, the better,” said Bill Sproull, vice president for business development & sales at ESS, a flow battery manufacturer in Portland, Oregon. To reduce need for fuel at remote military bases, the U.S. Army Corp of Engineers is demonstrating use of energy storage — flow batteries — as a baseload power source in military microgrids. 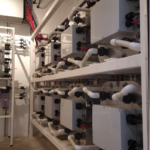 Installed at Fort Leonard Wood in Missouri, the test project is a precursor to possible use of flow batteries at the military’s forward operating bases, or FOBs. 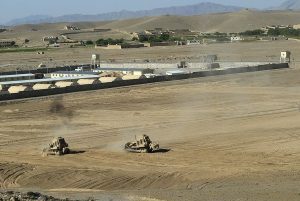 Removed from main bases, these tactical facilities allow for quick military action in what are sometimes remote regions. The Fort Leonard Wood demonstration uses two 30kW/110kWh ESS’ all-iron flow batteries with ARDA Power battery DC-DC converters. The battery saves fuel by replacing jet fuel generators as baseload power. Jet fuel generators, often used for remote military microgrids, are inefficient as baseload power. This is because they are built to meet the base peak load requirements, yet typically run at only 25 to 30 percent of that capacity, Sproull said. Instead of acting as baseload power, the generators will charge the long duration batteries when needed. With the battery serving “a constantly fluctuating load at the FOB, the generator will only be called upon to recharge the energy storage, allowing it to operate at peak fuel efficiency and dramatically reducing refueling logistics requirements,” said Tom Decker, program manager, U.S. Army Corps of Engineers. Decker also sees the flow battery as a pathway to more renewable energy in military microgrids. The batteries could act as the power source when the wind isn’t blowing or sun isn’t shining. And when the renewables are generating power, any excess energy they create could charge the batteries, reducing use of the fossil fuel generators even more. In addition to saving fuel, the battery makes equipment hauling easier. The ESS flow battery uses iron, salt, and water for its electrolyte, but can be shipped dry. Local water is added when it arrives at the base. This lightens shipping weight 60 percent below conventional or other flow batteries, according to ESS. If the military operation moves to a new location, it can just dump the water, since it is non-toxic. Lighter, the batteries then can be transported via truck or helicopter in standard military containers. 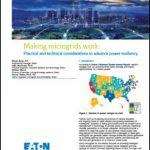 For more information on long duration flow batteries, see the white paper, “Beyond Four Hours,” in the Microgrid Knowledge white paper library. Batteries are not power sources, they are power time-shifting devices that consume about 25% of the power in each transaction. They do not replace generation capacity. Their roundtrip inefficiency loss and parasitic power loads consume the efficiency gain of load levelling the real generators. Batteries have 1/10th or less the power density of combustion engines, so are very bulky and heavy. These flow batteries represent additional infrastructure on the battlefield that would have to be moved and protected and maintained, increasing the burden on military troops and increasing their risk exposure. Flow batteries typically have a single direction transaction loss of 15% translating to a round-trip loss of 30%. Combining solar generation with flow batteries or even cost-competitive light weight Lithium Ion batteries can result in the requirement of very less number of fuel tanker supplies. While transporting the base, instead of hauling generator and combustible fuel, you take the lithium ion packs and the solar panels which can be stacked, saving space. I agree that there are challenges in implementing the same and it would take the military through a learning curve away from conventional fuel generators, but if it saves a life, it’s worth it. Please fix the mobile layout/dynamic options and version of this page….the article presently cuts off the right -most third of content and is impossible to read article (on Samsung Note 5). Should be okay now. Thanks for pointing it out! this is the key statement in the article: “dramatically reducing refueling logistics requirements”. The loss of lives and equipment takes place not at the FOB but in the transport of fuel. 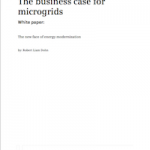 To obsess on the transaction losses of battery storage and quibble about terminology misses the point entirely in terms of strategy and tactics to diminish the factors that cause casualties in relation to FOBs.